President Moon Jae-in said Gandhi had inspired Korean independence fighters against Japanese colonial rule as well as last year’s candlelight demonstrations against impeached President Park Geun-hye. The Indian Embassy in Seoul has begun a two-year commemoration of national hero Mohandas K. Gandhi, commonly known as Mahatma Gandhi, ahead of the 150th anniversary of his birth next year. The diplomatic mission is preparing for a series of events to mark the legacy of India’s foremost freedom fighter, who waged a nonviolent struggle against British colonial rule and inspired the world toward peace. “Mahatma Gandhi, who was born on Oct. 2, 1869, is revered in India as Bapu, the father of the nation and the world over as the ‘Mahatma’ or ‘Great Soul.’ He provided a steadfast, principled and righteous leadership for India’s freedom struggle,” said Indian Ambassador to Korea Sripriya Ranganathan at a commemorative event at the embassy on Oct. 2. Gandhi’s leadership formed the basis of the Indian Constitution’s egalitarian provisions, she added. In paying tribute, Prime Minister Narendra Modi recently reminded his compatriots of Gandhi’s life’s work, wherein he exhorted people to sympathize with and help society’s poorest and weakest members. 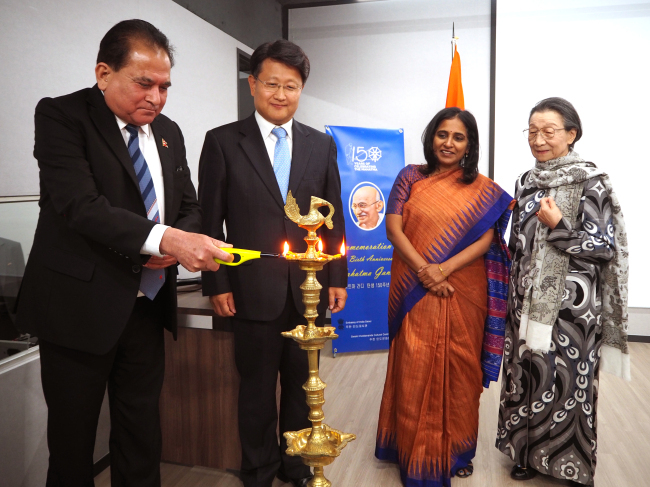 Korean Ambassador for Public Diplomacy Bahk Sahng-hoon noted that Gandhi’s pursuit of humanism led the United Nations to designate Oct. 2 as the international day of nonviolence in 2007. During President Moon Jae-in’s official visit to India in July, Bahk mentioned, he and Modi visited the Gandhi Memorial Museum in Delhi together, during which Moon said Gandhi had inspired Korean independence fighters against Japanese colonial rule as well as last year’s candlelight demonstrations against impeached President Park Geun-hye.